Often you will want to extract values that are returning from a test and write them into an excel file. This could be useful when building data sources dynamically from previous tests. SOAtest does not have a native interface to create Microsoft Excel files, however we can easily create CSV files that can be read by our CSV data source and can be edited by Excel. Please note that the quotation marks above, are two single quotation marks ' and not one double quotation mark ". The tools are now properly configured. You can use this method to load up the CSV file with values. In addition to this you will be able to edit these values with Microsoft excel as well as using the Excel and CSV data sources. 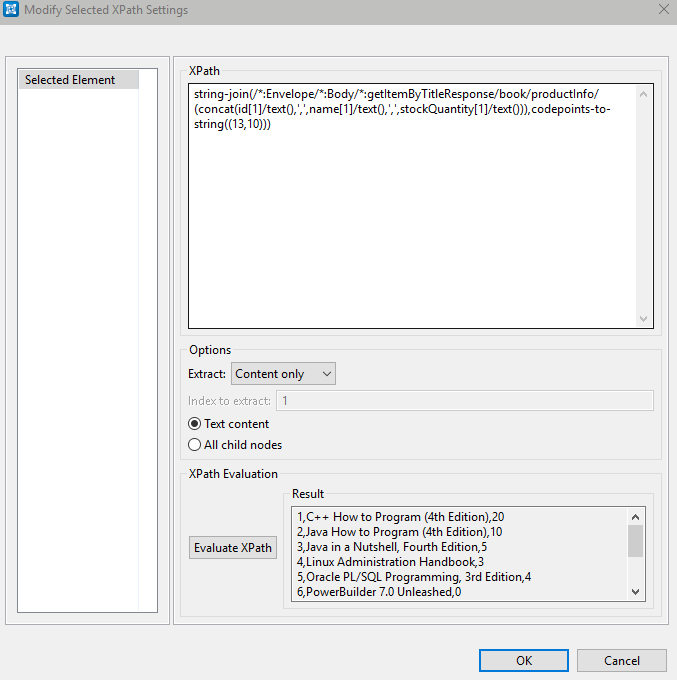 This technique can also be used to load up a data source that you will eventually use in a Virtualize Responder as the Data Source correlation. Has anyone actually got this to work? This seems really simple but It does not work for me. What portion of the workflow are you having trouble with? Is there an error you're seeing? I have two repeating nodes. 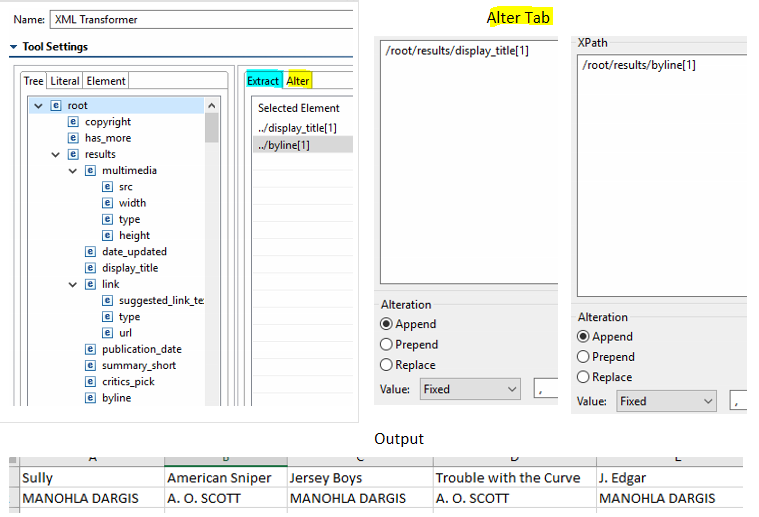 On the alter tab I xpath (all occurrences) for each and append a comma on the first node, not the second. 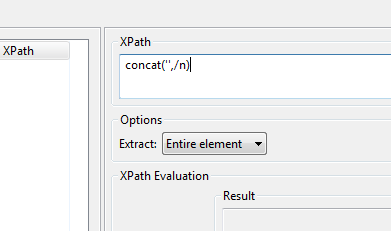 On the extract tab i randpoml picked a node and replace the xpath with concat('',/n). when run I get zero bytes. I would expect the output would be two columns on the csv (one for each node). I have tried several different methods. I can get it to work horizontal, where I have node1 comma separated values on first line and node 2 comma separated values on line2. The concat('',/n) just does not work and the only way I get close is doing it this way. Here is my screenshot. I'm using similar approach, but with string-join and concat. looks like bellow and works like a charm on my side. Then you just need to add WriteTool to save output on filesystem. Be aware about codepoints-to-string usage, it will create CSV file with MS Windows format (CRLF) and that you may need to wrap texts with double quotes (or other delimiter) for MS Excel. 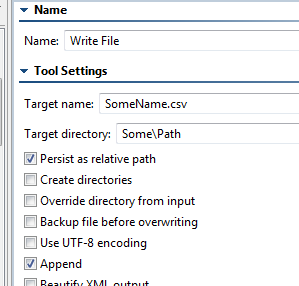 Hi all, getting save the csv file but in file value not get reflected . Any one can help one scenario ? 1. I have one request with multiple data and want to hit the client . 2. Client will response one unique id. 3. I have to save unique id and then once aggai have to hit the client. 4. Client will give response based on unique id . 5. In response dependent on first request where we have data. I want to store First Request and second response in CSV file then based on second request , i want to fetch the data and setup the final response. Hi @Shashi7403, if I understand your scenario correctly you don't need to use a CSV file to handle your scenario. You can simply save the value from the first response using a data bank, and then parameterize your second request using the parameterized value. The data bank will allow you to store and reference the value without needing to write out a CSV file. Please let us know if that works for you. But the problem is we have multiple same child node which have different value . from the first request will get response as Unique ID. (This Unique have to save and also want to map with first request). Now once again have to get above Unique id and then have to sent to client. Now finally will get ACK Response where data belong to first request. The fact that you have multiple child nodes with different values does not require you to save as CSV. The only time you would need CSV is if you need to save those multiple values. 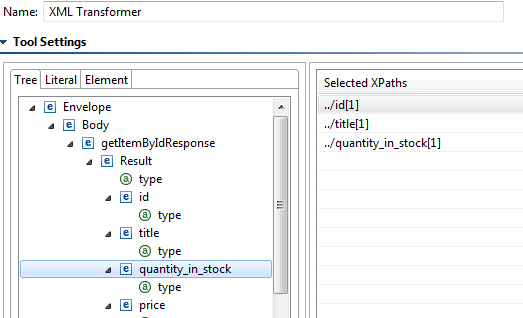 If you need to save only a single value, a data bank will work as long as you create an XPath that extracts the exact value that you need. So how many values do you need to save to send in the second request? Not able to generate CSV file in system location. For JSON you can use an XML Converter tool to convert the JSON to XML, and then you can use teh XML Transformer as described. Is it possible to get the headers/tag names in CSV using this approach ? 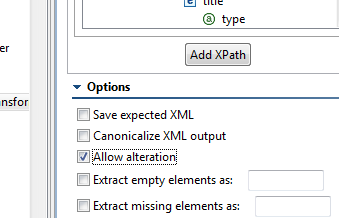 Yes - you can use an XML Converter tool to convert from CSV to XML, and then use an XML Data Bank to extract the values you want. I want to create a CSV file with the header/tag names. 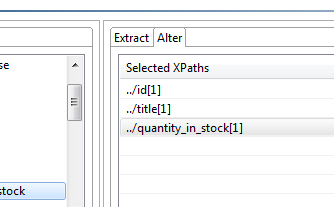 When I extract the values from XML into CSV, I get the values but no headers/tags. I want to know how I can have the headers/tag names in the CSV that I am creating. Can you post an example XML/CSV so it's more clear what you are trying to do? Unfortunately I can't. 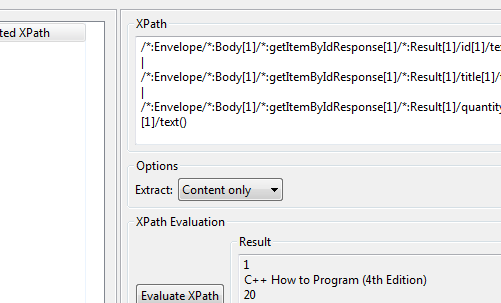 I am using the process described to create CSV files from Data extracted from tests. The data extracted is in XML format. When I use the Transformer to write it to CSV file, it gives me the value of the element. I need to have the first Row in CSV as the Column name which is same as tag name. I am able to extract SERVICE in my CSV. I want to add Description as my Column name in CSV.